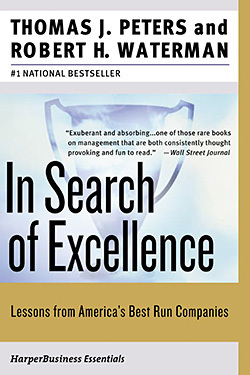 We continue our examination of the business book In Search of Excellence with an interview of author Tom Peters. Why was it so successful, what is the book’s legacy and what does a restaurant owner in Chicago have in common with Jack Welch? What was the impetus for you to write In Search of Excellence? In the mid to late ’70s the U.S. was going through something that, on many dimensions, looks closely akin to what’s going on today with China, only it was with Japan. And the idea was that America’s time was up. Japanese companies and the Japanese economy was going to take over the world. It was extreme, as it turned out–just as I think a lot of the language is today. A couple of guys, Bill Abernathy and Bob Hayes, wrote a seminal article in Harvard Business Review which was called, “Managing Our Way to Economic Decline.” These two Harvard guys had fundamentally said while we got too caught up in thinking about strategy and analysis and we missed stuff like people and quality, focusing in that initial round on the Japanese pounding the crap out of us in car quality. Well at the same time that was going on, McKinsey, where Bob Waterman and I were partners–he was s senior director and I was junior partner–was also taking a look at itself. We didn’t use the word knowledge capital in those days, but McKinsey was fundamentally assessing its knowledge capital. McKinsey made a huge investment on a project on strategy, because strategy was the alpha and the omega of the consultant’s world, and the GE world, and so on. And started this little project out of San Francisco on organization effectiveness. And to make an incredibly long story incredibly short, I was sent off to wander around the world and see what the hell was going on in terms of organizational effectives, and then this happened and that happened. I did some research that was funded, initially by Royal Dutch Shell, secondarily by Siemens, and it ended up, after a couple of in-house presentations, as a piece in BusinessWeek in 1977 or 1978. And out of that came a book contract, and the rest is history. It was driven by times of soul searching not unlike today and in particular was the idea to look for something a little bit more complete than the notion that if you get the strategy right the rest will take care of itself. Bob and I focused on all the other stuff that had to do with people and implementation and hustling and so on. Why do you think the book was so successful and resonated with the business world ? Three things. The one that is the most important with virtually any new product, whether it’s ours or anything that comes along in business, is perfect timing. The Americans were getting kicked around. There had been a whole series of books, like the one called The Art of Japanese Management and another called Theory Z, and the centerpiece of the books is that there is a Japanese way of managing and we better damn well start practicing it. Waterman and I were fierce critics of American management, but we did say there were some companies that were doing it right. Essentially, it said you don’t have to look across the Pacific ocean if you want to find well-managed companies that are focusing on quality and people. You can do it at home. Which I think was a very big deal. Number two, which was also part of timing. If you can imagine such a book coming out a year or a year and a half ago here. When we published the book it was the same week that American unemployment went over 10% for the first time since the Great Depression. That was ’82 or something like that. Number three was Bob and I wrote case studies. And that is what everybody and his and her brother does today, but it was totally new at that time. Meaning that Peter Drucker had said extraordinary things and valuable things, but he never mentioned company names–nobody mentioned company names. We stuck our necks way out and gave the cases from IBM and McDonald’s and various other places. Those were the three big reasons that it took off. Looking at how the world’s changed since the book came, do you feel it’s had some sort of legacy? I think it was near the beginning of a movement. And the movement has led to Good to Great, and it’s led to Gary Hamel’s work, and so on. It think it would be the height of arrogance to say there was In Search of Excellence, and then this or that. There were books about Jack Welch and books about Lee Iacocca in the 1980s. You can’t draw some kind of linear, straight line from In Search of Excellence to something that was published last week. But clearly it was part of, and probably the most visible part of, this explosion of interest in business and management, which went from, “Oh my God! We’re losing” in the ’80s, to “Oh my God! We know the answer to everything” in the ’90s, back to “Oh my God! We’re losing” again in the late part of the ’00s. Can you think of any companies today that epitomize those characteristics of excellence? One of the biggest problems of In Search of Excellence is that it focused on giant, publicly-traded companies. There are thousands upon thousands of excellent companies. Some of them are two-person accountancies in a community of three thousand people. And the obvious ones like the Googles, or if you go back five or six years, the Microsofts, and so on. It’s really important not to focus on this company or that company and see this is the be-all and end-all for all time. On New Year’s Eve I went to a fabulous restaurant in Chicago that was well known and at 1:00 a.m. I watched the owner, who probably was in her mid-fifties or her early sixties, I watched her at 1:00 a.m. on January 1st standing out on the street hailing cabs. And as far as I’m concerned that is as significant in its own way as anything Jack Welch did at GE. How has the writing process changed for you, from Excellence to your recent book Little Big Things? I would like to think that among those that have down business books over the years that Peter Drucker and myself and a couple of others are rather uncategorizable. Business book writing for me is when some set of ideas gets stuck in my mind, I write a book about it. I haven’t got a theory and I haven’t got a framework. When I got on the topic of design a few years ago I wrote a book about design. When I got the topic of women as leaders and marketing to women, I wrote a book on the topic. Despite my training as an engineer and having an MBA, there’s no logic to it. It is what it always is. I write a book and a few years later something else really pisses me off and eventually I write a book about it. What makes a good business book stands out? To me, it’s cases. I am not looking for a repeat of the works of Aristotle. And I am not looking for the quality of fiction that you would expect from Dickens or Anita Shreve. I am looking for stuff I can use. I endorse a lot of people–sometimes people say I endorse too many books. And my response has always been the same: If I can get one case study that can give me one good idea that I can implement for $25, or for these days one-third of that on Kindle, I’ve gotten a very good deal. To me it is case studies, case studies, and more case studies. And then I will draw my own conclusion, thank you very much. Though obviously put stuff into boxes, so you are getting help from the author, whether you want to or not. What are your three favorite business books? I don’t read many business books. I read good fiction. Business is about people so my favorite business books are anything by Dickens. 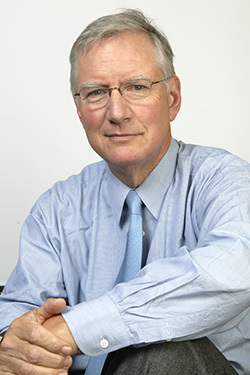 Tom Peters is the author, with Robert H. Waterman Jr., of In Search of Excellence, published by Harvard Business. Read more about In Search of Excellence or our Leadership Hall of Fame.